Monday, November 27, 2017 3:00 p.m. – 4:00 p.m.
Join The Muse, a live stream TV show based in Miami, at Brooklyn Vintage and Vinyl for a special interview with Popeye Caution. The founders of Brooklyn Vintage and Vinyl and Popeye Caution will discuss trends and movements in the music industry both locally and globally. Learn more here. Monday, November 27th, 2017 6:00 p.m. – 10:00 p.m. The Tech, Beats, and Bytes community invites you to join a special pre-Art Basel conversation featuring Paul Singh of Results Junkies, Franklin Simons of Pérez Art Museum Miami and Alberto Ibargüen of the Knight Foundation. Hosted by LaToya Stirrup & Michael Hall. Sounds provided by Rich Blackman followed by a session of #TBB Karaoke performances. Learn more here. 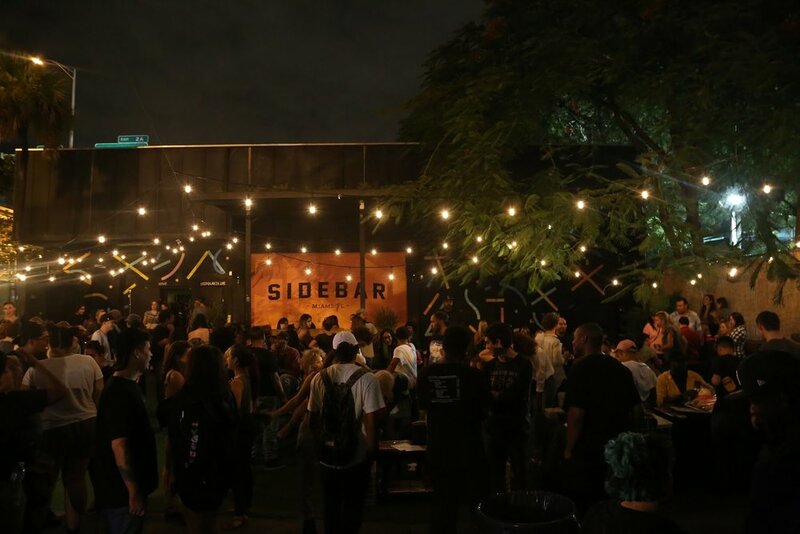 Thursday, November 30, 2017, 9:00 p.m. – 12:00 a.m.
Come out the last Magiazine Fair of 2017 at Sidebar during Ice Cream Thursdays. Support Local POC businesses and vendors from the community, and enjoy art installations, great food, drinks and music! Learn more here. Saturday, December 2, 2017, 10:00 a.m. – 4:00 p.m.
“We'll Look Over You-For Now” is a special collective exhibition featuring two local artists from Overtown/Liberty City, Terence Price II, and Reginald O'Neal. Both artists will use mixed mediums such as Film, photography, writing, and paintings to showcase how they presently see their community. Learn more here. December 2, 2017, 12:00 p.m. – 4:00 p.m. Soul LIT Sessions invites you to an intimate Q+A with legendary R+B Manager, Jeff Robinson exploring the key to Artist management: developing and breaking artists, securing the bag and building a strong team. The event includes a pre-event mixer, master class, and libations to follow. Learn more here. Saturday, December 2-4, 2017, 2:00 p.m. – 4:40 p.m.
Robert Wise and Jerome Robbins’ cinematic landmark brings Shakespeare’s Romeo and Juliet to Manhattan’s West Side as María (Natalie Wood) and Tony (Richard Beymer) fall in love in spite of the racially driven gang warfare. This screening of West Side Story is made possible by a grant from the Coral Gables Community Foundation. Learn more here. Saturday, December 2, 2017, 5:00 p.m. – 8:00 p.m.
Come out to Saturday Sessions, a monthly gathering bringing dynamic performances to the heart of Greater Fort Lauderdale (Historic Sistrunk). It is a free community event featuring live theater, music, poetry, and more. The mission of Saturday Sessions is to create an authentic cultural exchange between emerging artists and a community prepared to support them. Learn more here. Saturday, December 2, 2017, 8:00 p.m. – 10:00 p.m.
Jacq's is thrilled to introduce you to an evening of beauty, bites and face masks. Learn the keys to healthy, glowing skin and enjoy complimentary mini-facials courtesy of Miami's homegrown natural and vegan skincare brand Jacq's, along with complimentary mini-manicures from LVX Nail Lacquer. Learn more here. Saturday, December 2, 2017, 8:30 p.m. – 11:30 p.m.
Come out to the highly anticipated premier of the film "Abused" at the Little Haiti Cultural Center. Seats are limited, grab your ticket to reserve you seat today. Learn more here. Sunday, December 3, 2017, 11:00 a.m. – 1:00 p.m.
During this free 2 hour course, students will be introduced to all pattern making tools and vocabulary, fashion industry terms, pattern making techniques, how to take body measurements & how to place the pattern on fabrics and more. Learn more here.